It has not been a good week for BDSHoles in South Africa. BDSHoles protesting against a Daniel Zamir concert at Wits University last week were reported to have “felt like winners.” But when word got out at their shouts of “Shoot the Jew!” the fan was well and truly struck by some suspicious brown substance. A new spin on the controversial struggle song, Dubul’ ibhunu, this time calling for Jews to be shot instead of “boers”, has been criticised from all corners. 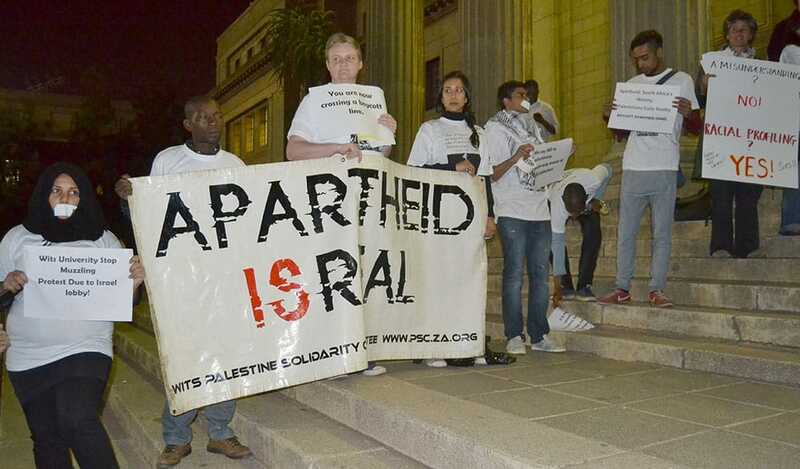 Dubula e Juda, which means “shoot the Jew”, was sung outside Wits University’s Great Hall last week by protesters from Boycott, Divestment and Sanctions against Israel (BDS) South Africa, an organisation that supports the Palestinian call for broad-based Israeli boycotts. Those sympathetic to the cause of BDS South Africa and Palestine denounced the incident, saying it was a setback for the movement. But the silent protests outside the hall turned into a new take on the controversial “shoot the boer” struggle song, to take on Jews. Respected health and education activists respectively, Nathan Geffen and Doron Isaacs, who have also been in support of Palestinian rights, came out strongly against the song. “We are committed to the struggle for Palestinian freedom, equality and justice. It is an extremely difficult struggle waged against one of the most effective and dishonest propaganda campaigns in history,” they said last week. Friedman agreed. “It gives a publicity break to the other side,” he told the M&G. Indeed, “the other side” in the form of the strongly pro-Israel South African Board of Deputies were quick to condemn the statement in strong terms. “SAJBD national chairperson Mary Kluk believed that by allowing its members to make such hateful and dangerous statements and subsequently defending them for doing so, BDS SA had revealed its true colours,” the organisation said on Monday. Friedman said people around the world support BDS South Africa based on its moral power and stance against human rights abuse in Palestine, but the organisation risked losing its moral power over the incident. Pro-Palestinian organisations like the Media Review Network (MRN) distinguished between Jews and Zionists. “Our arguments are never against Jews,” said MRN’s Firoz Osman, who recently co-authored a book Why Israel? The Anatomy of Zionist Apartheid – A South African Perspective. “Ronnie Kasrils gave a powerful keynote at the launch of Why Israel,” said Osman. Which brings me to their next setback. In this “powerful keynote”, Ronnie Kasrils was on the record as supporting Iran, Hizbullah and Syrian dictator Bashar Assad (hat tip: Avi Mayer). In other words, Kasrils is admitting there is much barbarity in the world but believes Israel should be singled out for special treatment. Yet apparently this barbarity does not include what Assad is doing to his own people in Syria. These kind of sentiments – as well as the shouts of “Shoot the Jew!” – give a good insight into what these BDSHoles truly stand for.